That's great. I have really been enjoying my Vita and would like to see a real competitor in the handheld market that focuses on gaming. Though, I use my Vita as much like a media tablet as a gaming machine. I just find it much more portable than tablets on plane flights for some reason and better at gaming in general. I hope it keeps it up. I don't see any way I'll be getting more games made for it otherwise. I'm not surprised really - Given that PS+ gives you games for all the Sony systems, if I had a PS4 and PS+ I would strongly consider acquiring a Vita since I wouldn't need to buy games for it in order to use it. Thinking of getting PS4 first (will eventually get all new gen consoles) and probably will be buying Vita to accompany it. Pretty much the behaviour that the article is illustrating. I'm glad Sony didn't try to abandon the poor thing after it had done so terribly. The Vita is a great console with a lot of possibility, but the problem is people just don't want to develop for the thing. We need more Tearaway's and Gravity Rush's out there. We need more exclusives, damn it! Also, the cross-buy and cross-play feature is great, especially for indie games (Bought Spelunky on Vita, got the PS3 version for free, can now do split-screen with both consoles via wifi), and I imagine the remote play feature works really well. I've yet to try it, but that's a feature that's really enticing for me, because my family really loves using up the living room TV -which is the largest one in the house- very often. And now that I have the ability to play the game anywhere in the house without bothering anyone that wants to use the TV, I'm really happy. It's like a WiiU, except good! I just hope all future titles I want to play support it, but judging by how many launch titles support remote play right now, I shouldn't have anything to worry about. Aside from the occasional game that requires Move or the PS Eye thing, of course. But yeah. Go buy a Vita. Play it. Have fun. I'm loving it with Dragon's Crown, Persona 4: Golden and Ys: Memories of Celceta. I'll love it even more with the coming of being able to play FF14: ARR remotely with it. 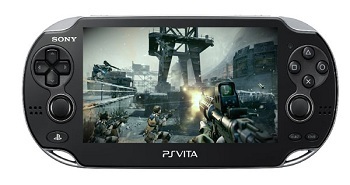 Since demand for PS4 is strong, Sony should try bundling some with Vita. Couldn't hurt (a lot). I'm currently playing Soul Sacrifice which is one of my favorite games of the year.